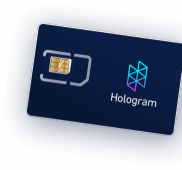 Hologram’s platform gives IoT products a competitive advantage to connect simpler, and scale faster. Deploy to new countries or with new hardware technologies all through the same Hologram global IoT SIM to streamline your IoT deployments. Keep devices connected in the field with Hologram’s network of networks and automatic carrier switching to the best signal available in each country. Pricing that automatically scales with you. Discounts start at just 100 devices. Change your plans anytime from our Dashboard. Use our SIM card in any hardware device and connect to any IoT cloud service. Use our powerful REST APIs to integrate quickly. 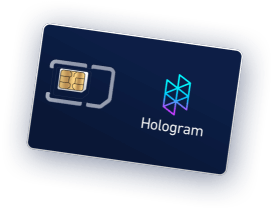 Hologram simplifies your entire go to market strategy, so your IoT devices can connect and scale easily. Cannot trial or test service. Enter long enterprise contract process. Inflexible contracts lock in pricing with costly minimums early on. Scaling to new markets, global coverage requires multiple providers and SIMs. New contracts and limitations when trying to adopt new tech like CAT-M.
All customers can sign up and get devices online in under a week. Total flexibility, without minimums. Pricing drops as you grow. Access to multiple carriers in each country, with auto switching through one IoT SIM. No need to swap SIM cards to get access to new carriers and tech. Get your devices online in a week. Start conquering the entire globe with a simple SIM swap. We're here every step of the way. Explore how you can connect anything – from just about anywhere – using our free Global SIM card and integrated IoT platform. Answers to common IoT and Hologram questions. Resources to get online and scale up quickly. Embed connectivity directly into your tools and services. A vibrant, collaborative community of IoT leaders. Unlock global coverage and get online in days not months. Need something specific? Already at scale? Let’s talk.